One of the most fun weekends on the college football calendar is rivalry weekend, typically Thanksgiving. 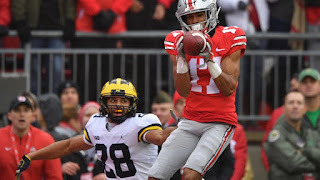 And the main dish this year was Ohio State vs. Michigan, both teams 10-1, playing for a division title and a chance to make the college football playoff. Michigan favored, but traveling to Ohio State. And it was an unlikely hero that derailed the Wolverines title hopes. Freshman Chris Olave came into the game with 5 catches for 70 yards on the season. And left this biggest game of his career with 3 TDs. All in critical spots. His first TD catch started off the scoring giving the Buckeyes a 7-0 lead. His second catch (also a TD) boosted Ohio State to a 14-6 lead. But it was his blocked punt in the third quarter that put Ohio State up by more than 2 TD. It would never get close again. Ogave has a bright future in Columbus and in football, and is our Longhorndave Sportsman of the Week!